In November 2018, the German government announced measures to strengthen the development of artificial intelligence (AI) in Germany. But what does this mean for society? Since October 2018, a team of four at the Freiburg Institute for Advanced Studies (FRIAS) has been researching the social, legal, ethical and technical challenges arising from the interaction between humans and autonomous, intelligent systems. 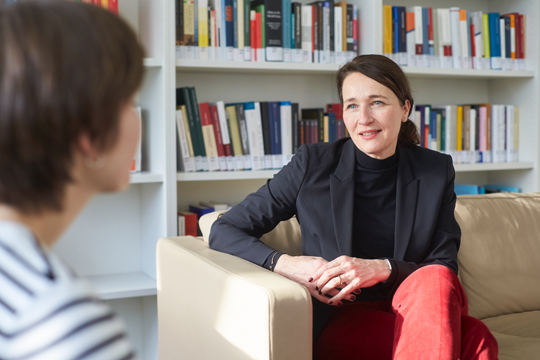 Silja Vöneky, Professor of International Law, Ethics of Law and Comparative Law at the University of Freiburg, is part of the research focus “Responsible Artificial Intelligence.” Sophie Baar spoke to Vöneky about the interdisciplinary cooperation at FRIAS. Ms. Vöneky, how did the idea of addressing the topic of “artificial intelligence” in an interdisciplinary team come about? Silja Vöneky: Philipp Kellmeyer, neurologist at Freiburg University Hospital, who had previously worked with Oliver Müller, professor at the Department of Philosophy came up with the idea. He approached me because I had been working intensively on the regulation of the risks of new technologies for a long time. With Wolfram Burgard, we were able to bring one of Germany's most renowned robotics experts into the team, who is very familiar with the technical possibilities of AI and the current state of international research. In our opinion, the topic should be researched on an interdisciplinary basis. Philosophical and ethical questions create the foundation for discussion: What is intelligence and when do we talk about “artificial” intelligence? We also examine concepts such as autonomy, responsibility and attribution and how these concepts can be used in the development and use of AI. What has your time at FRIAS provided you thus far? More freedom for research, close and uncomplicated cooperation within our interdisciplinary team and the opportunity to invite researchers and lecturers working on the same topics. The aim is to produce joint publications. They will deal with questions of responsible AI, which will be investigated and developed as a model for European regulation. We are also planning a symposium on new rights in April 2019 and are submitting joint applications for third-party funding in these areas. The exchange with other fellows at FRIAS has also given me a lot of inspiration. Recently, I spoke for a long time with a financial mathematician about risk regulation issues in a democratic state. It was an unplanned meeting that gave me another perspective. This exchange has certainly influenced my own research work. What are the next steps for you and the research project this year? During the summer term, we will continue to deal with the concept of “intelligence.” In order to bring the topic closer to students, we organize the lecture series “FRIAS Lunch Lectures” on Thursdays and offer seminars. In addition, we will deal more intensively with security issues, such as the legal and ethical aspects of the use of autonomous weapons. This is an important topic for me, not only as an international lawyer, but also for our group. In the long term, we will continue to work on the possibilities of legitimate governance of AI. Before Christmas, the European Commission of Experts developed a codex on the governance of artificial intelligence. Major international companies already have similar codices that define the procedures and limits of development and deployment. We want to critically analyze these regulations and introduce our own ideas, possibly also a Freiburg method of governance, into the discussion. The Freiburg Institute for Advanced Studies offers researchers from all disciplines of the university the opportunity to work together intensively on a project for one year with the “Research Areas” program. Groups of three to four professors or junior professors are eligible to apply. The deadline is April 15, 2019.